The Knowledge Solution. Stop Searching, Stand Out and Pay Off. The #1 ALL ENCOMPASSING Guide to 64-Bit Computing. An Important Message for ANYONE who wants to learn about 64-Bit Computing Quickly and Easily... "e;"e;Here's Your Chance To Skip The Struggle and Master 64-Bit Computing, With the Least Amount of Effort, In 2 Days Or Less..."e;"e;In computer architecture, 64-bit int… egers, memory addresses, or other data units are those that are at most 64 bits (8 octets) wide. Also, 64-bit CPU and ALU architectures are those that are based on registers, address buses, or data buses of that size. 64-bit is also a term given to a generation of computers in which 64-bit processors are the norm. 64-bit is a word size that defines certain classes of computer architecture, buses, memory and CPUs, and by extension the software that runs on them. 64-bit CPUs have existed in supercomputers since the 1970s (Cray-1, 1975) and in RISC-based workstations and servers since the early 1990s. In 2003 they were introduced to the (previously 32-bit) mainstream personal computer arena in the form of the x86-64 and 64-bit PowerPC processor architectures. A 64-bit register can store 264 = 18 446 744 073 709 551 616 different values. Without further qualification, a 64-bit computer architecture generally has integer and addressing registers that are 64 bits wide, allowing direct support for 64-bit data types and addresses. However, a CPU might have external data buses or address buses with different sizes from the registers, even larger (the 32-bit Pentium had a 64-bit data bus, for instance). The term may also refer to the size of low-level data types, such as 64-bit floating-point numbers. Get the edge, learn EVERYTHING you need to know about 64-Bit Computing, and ace any discussion, proposal and implementation with the ultimate book - guaranteed to give you the education that you need, faster than you ever dreamed possible!The information in this book can show you how to be an expert in the field of 64-Bit Computing. Are you looking to learn more about 64-Bit Computing? You're about to discover the most spectacular gold mine of 64-Bit Computing materials ever created, this book is a unique collection to help you become a master of 64-Bit Computing. This book is your ultimate resource for 64-Bit Computing. Here you will find the most up-to-date information, analysis, background and everything you need to know. In easy to read chapters, with extensive references and links to get you to know all there is to know about 64-Bit Computing right away. A quick look inside: 64-bit, Word (computer architecture), 1-bit architecture, 12-bit, 128-bit, 16-bit, 16-bit application, 18-bit, 24-bit, 26-bit, 28-bit, 31-bit, 32-bit, 32-bit application, 36-bit, 4-bit, 48-bit, 60-bit, 8-bit, Binary pattern (image generation), Byte, Chunk (information), List of binary codes, Nibble...and Much, Much More!This book explains in-depth the real drivers and workings of 64-Bit Computing. 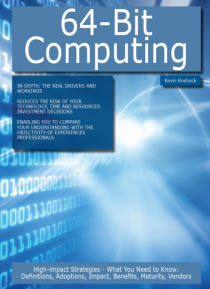 It reduces the risk of your technology, time and resources investment decisions by enabling you to compare your understanding of 64-Bit Computing with the objectivity of experienced professionals - Grab your copy now, while you still can.